Which water is best to drink? This is probably one of the most common questions I am asked and realise how confusing it has become to actually know which water is the best one to drink. There is no straight forward answer to this as there are so many different types and all of them provide some benefits and some not so good benefits. We are made up of nearly 80% water so the quality (and quantity) of what you drink matters. There is something wonderful about quenching your thirst on a hot day with a fresh cold glass of water. Because we can’t see what’s in it, we imagine it’s going to be good quality and don’t consider in fact it’s not as pure as it could be. We know that water can help us concentrate, keep headaches at bay, help the skin, aid digestion and even reduce the risk of some cancers. When we don’t get enough our body will really show it and sometimes we mis-read the symptoms for other conditions. Dr Patanjali wrote extensively about dehydration causing all sorts of symptoms in his book, The Body’s Many Cries for Water. All sorts of things! Just imagine human wastes, oil, grease, fats, food wastes, poisons such as pesticides, synthetic chemicals, drug residues, hormones, bacteria, viruses, parasites and heavy metals all get into our water. This waste can come from any number of sources – households, shops, offices, farms, factories, vehicle maintenance companies, run-off water from roads and drains. Of course water companies are there to ‘clean’ up our water and they will do so meeting limits set by the European Water Directive mainly derived from recommendations made by the World Health Organisation (WHO). These limits are set according to what may constitute “health risk” to the public drinking water. These are broad brush limits and do not take into consideration types of individuals who may be affected by different concentrations of chemicals such as children, weak or frail individuals or those who may have chemical sensitivities. I often wonder about the detrimental effect of these low concentrations on our health over our lifetime. If we are looking to drink water for health then we need to ensure that we get the best quality of water with the minimum amount of these chemicals in it. So which water contains most of these and which water the least? It’s free and available in unlimited supply. It is regularly monitored by the water companies for bacteria, heavy metals and chemicals which are harmful to us. Water is treated through a purification plant and then disinfected with chlorine prior to distribution. This will kill most bacteria and some parasites but not necessary all, for example Giardia and Cryptosporidium may get through and can cause gastrointestinal problems. Fluoride is now also being added to some drinking waters in the UK in order to help reduce tooth decay. It is another substance which is debateable as to whether it should be in our water supply as there are other ways to reduce tooth decay. Some see this as forced mass medication going against personal choice. The cocktail of chemicals in tap water (as listed above), even though set at ‘acceptable’ limits by the EU, it is still doubtful as to their long term effect on health at these concentrations. One good thing is that all the natural minerals are generally present in tap water and not taken out by any filtration process. I see tap water like fast food, it’ll feed you but it’ll also give you lots of things you don’t want too. There a two types of bottled water spring water and mineral water. Sometimes the terms are used synonymously but they are in fact very different. Spring water is directly bottled at source from water that comes from a spring in the ground. Mineral water comes from underground and flows over rocks giving it a higher content of minerals. It has to have a certain level of minerals and be certified to be called ‘Natural Mineral Water’. It therefore is priced slightly more than spring water. Although most bottled water is of good quality, studies carried out by National Resource Defence Council in America showed that sometimes bottled water contained more bacteria and chemicals than limits set on tap water. Since 1999 in the UK bottled water is now subject to regulation. Bottled water is not treated with chlorine nor has any added chemicals such as fluoride. The cost on the environment is the biggest here due to bottling. I would look at the cost of spend on bottled water verses that of getting a filter fitted in your home. Having carried home numerous bottles and filling up my recycling bin with empties, I eventually worked out that it was worth getting a filter fitted at home. Here you will need to consider the filters that will leave in the good stuff (i.e. minerals) and take out the ‘bad’. Filtering tap water through a filter will certainly remove more contaminants but all of them do so at different levels. Your best guide is cost, the more the filter takes out the more it will cost! Jug filters – these are the simplest of filters – granulated activated carbon. They will remove chlorine, large parasites, mercury and some chemicals. They will not remove bacteria, fluoride, heavy metals, asbestos or radioactive compounds. Although they are relatively inexpensive you do need to change the filters on a regular basis. Some will now have a display which shows you when to change it. They are definitely worth considering if this is your only option but do take a look at fitted filters in your home, they may be more cost effective in the long run. Home fitted filters can be plumbed into your home either just in the kitchen or to the main water supply into the home so that the whole house is supplied with filtered water. A carbon block filter is generally fitted into the kitchen onto one tap. Although it costs more than the jug filter it offers higher filtration and requires less replacement. It removes everything the granulated type will as well as more range of chemicals, solvents and some radioactive contaminants. It does not remove bacteria, fluoride, heavy metals, asbestos or radioactive compounds. These are made of both ceramic and carbon. It will remove a large range of contaminants from the water. They are generally fitted in the kitchen to the main supply and the filtered water is supplied through a separate tap. Some of these filters will be impregnated with silver which works as a strong antibiotic to bacteria and parasites. These filters will remove quite a large number of contaminants including chlorine, most micro-organisms, cysts, some solvents, pesticides, some chemicals and most heavy metals. They do not remove fluoride or some very small micro-organisms. The filters will need to be changed every 3, 6 or 12 months depending on how much water you use. A large family may need to change the filter more frequently than say someone living on their own. They are effective filters and offer good value for money. This is probably one of the most effective methods of removing 99% of contaminants in water. It is the one used to remove Fluoride from water. 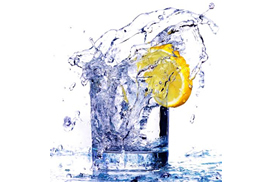 Untreated water passes through a semi-permeable membrane under pressure causing the pure water to be removed from the untreated (opposite of the natural osmosis process). Nearly everything is removed from the water except some pesticides and volatile organic compounds (VOC’s). Some systems will include a ceramic carbon filter to remove these substances as well either before or after the water passes through the membrane. These systems are quite sophisticated and therefore are significantly more expensive to buy. The running costs are similar to that of the solid carbon-ceramic filters. One of the disadvantages of RO is that it also removes all the minerals from the water. However, one would say that it better to obtained these minerals through food or supplementation allowing you to drink pure water. Due to effectiveness of RO in removing fluoride these systems are gaining in popularity. Water is boiled and the steam is condensed into a container leaving behind nearly all contaminants as well as all the mineral content. Some volatile organic compounds (VOC’s) may get through with the steam but it is effective in removing fluoride. Distilled water requires a lot of energy and is therefore costly and not seen as environmentally friendly. It is sometimes recommended to use distilled water in some naturopathic treatments. Water companies will recommend boiling your water to purify it if there have been any problems with the main water supply. It can also be effectively used in rural or wilderness settings. It is effective in killing harmful bacteria and parasites. I recommend you aim to drink as pure a water as possible but this isn’t always possible. Don’t worry about it, just drink a variety of different types and yes, that includes tap water. It’s more important you hydrate yourself than wait for hours before drinking a filtered version. I used to drink mainly from bottled water and then opted to get a ceramic carbon filter fitted in the kitchen, this was great as I could use it to drink and cook with, it saved me carrying all those bottles home. It wasn’t that expensive in the end, I found a friend who fitted it for me. Having moved house into a rented property, I took it with me but have reverted to using a jug filter for the time being. My next purchase will definitely be a reverse osmosis filtration system. To me the investment is worthwhile because so is my health. I use a company called The Fresh Water Filter Company for my own personal use and to refer clients. I get a small referral fee but I pass most of it onto my clients. I have made arrangements to extend this to my blog readers so that you get a 10% discount on any purchases you make. You will need to quote this code – RAMZ038822. By all means give them a go but feel free to look at others too.